The Forty-seventh United States Congress was a meeting of the legislative branch of the United States federal government, consisting of the United States Senate and the United States House of Representatives. It met in Washington, D.C. from March 4, 1881, to March 4, 1883, during the first and only year of James Garfield's presidency, and the first two years of his successor, Chester Arthur's tenure. The apportionment of seats in this House of Representatives was based on the Ninth Census of the United States in 1870. The House had a Republican majority; the Senate was evenly divided. Senators were elected by the state legislatures every two years, with one-third beginning new six-year terms with each Congress. Preceding the names in the list below are Senate class numbers, which indicate the cycle of their election. Members' names are preceded by their district numbers. Wisconsin (3) Vacant Senator Matthew H. Carpenter died in the previous congress. Maine (2) James G. Blaine (R) Resigned March 5, 1881, to become U.S. Secretary of State. 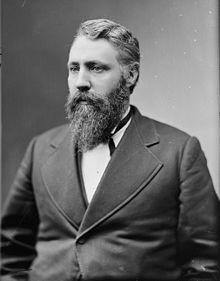 Iowa (2) Samuel J. Kirkwood (R) Resigned March 7, 1881, to become U.S. Secretary of the Interior. Successor appointed March 8, 1881, to continue the term. Minnesota (2) William Windom (R) Resigned March 7, 1881, to become U.S. Secretary of the Treasury. New York (1) Thomas C. Platt (R) Resigned May 16, 1881, as a protest against federal appointments made in New York. New York (3) Roscoe Conkling (R) Resigned May 16, 1881, as a protest against federal appointments made in New York. Rhode Island (1) Ambrose Burnside (R) Died September 13, 1881. Colorado (2) Henry M. Teller (R) Resigned April 17, 1882, to become U.S. Secretary of the Interior. Georgia (2) Benjamin H. Hill (D) Died August 16, 1882. ^ a b "The Great Senate Deadlock of 1881". Senate.gov. US Senate. Retrieved 1 July 2014. Congressional Directory for the 47th Congress, 1st Session. Congressional Directory for the 47th Congress, 1st Session (1st Revision). Congressional Directory for the 47th Congress, 1st Session (2nd Revision). Congressional Directory for the 47th Congress, 2nd Session. Congressional Directory for the 47th Congress, 2nd Session (Revision).